The calm and shallow Sapodilla Bay Beach. A small sheltered cove that offers shallow water, this is an excellent beach to visit with children or to simply relax at. Found off the south coast of Providenciales near Chalk Sound, Sapodilla Bay is a 900 foot (275 meter) long stretch of sheltered beach. The water here is very shallow, calm and clear, and is an excellent choice for families and those visiting with small children. This beach is a 10 mile (16km) drive from the central tourism region and resorts of Grace Bay. The calm and beautiful Sapodilla Bay Beach. Sapodilla Bay offers an interesting setting. There are luxury vacation villas on the beach and surrounding coastal cliffs, private yachts anchor in the bay, and the nearby Chalk Sound area is beautiful. 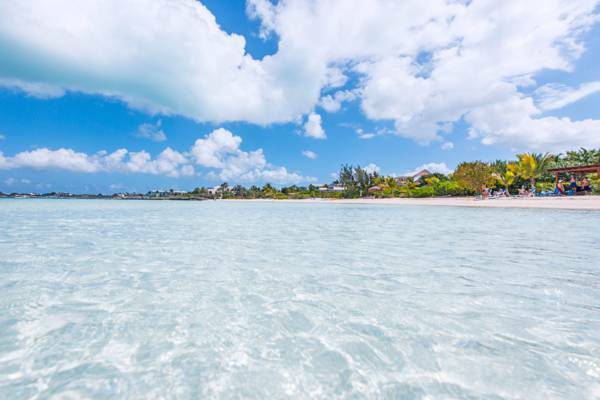 The ocean water temp in the Turks and Caicos is always great, yet the sheltered coast of Sapodilla Bay and Taylor Bay tend to have even warmer water due to localised heating by the sun. 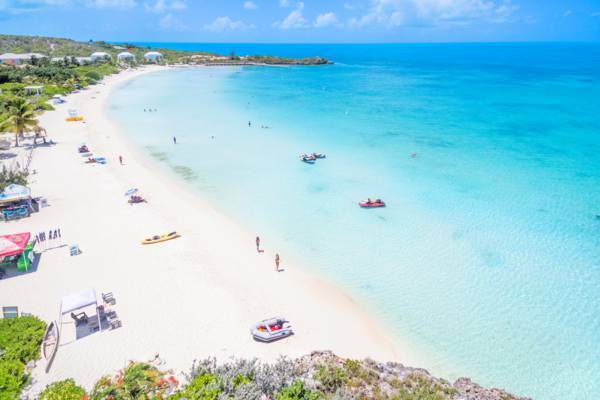 The world-famous Grace Bay Beach of course sees far more guests, however, Sapodilla Bay can feel a little more crowded on busy days due to the limited extent of the beach. 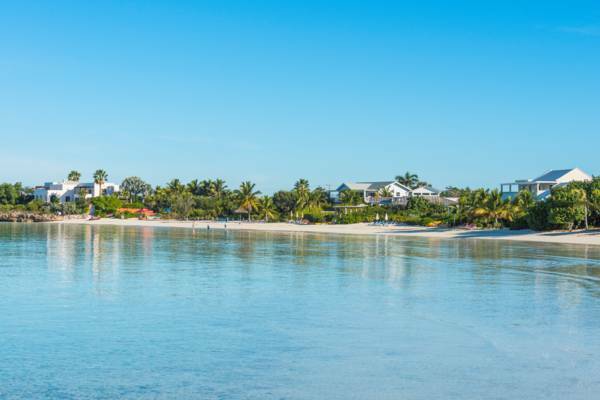 The small yet sheltered Sapodilla Bay Beach offer calm and shallow water. The underwater sights at Sapodilla Bay do not compare well with the exquisite snorkelling sites of Smith's Reef and the Bight Reef, however, there are some ocean creatures to spot. If you’d like to snorkel, colourful reef fish, sea urchins, and small amounts of coral can be seen at the foot of the small coastal cliffs. Off the adjacent cliffs and pier, it’s also possible to see schools of bonefish, barracudas, stingrays, and eagle rays. Conch and starfish may also be seen in the sea grass patches in the area. 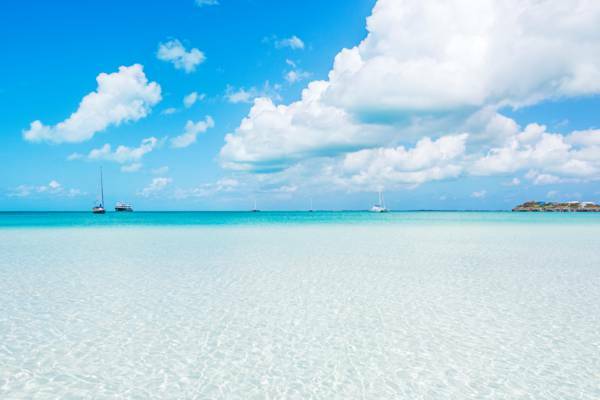 Every beach in the Turks and Caicos is unique, and one of the interesting aspects of Sapodilla Bay is its white, very fine, silt-like sand. 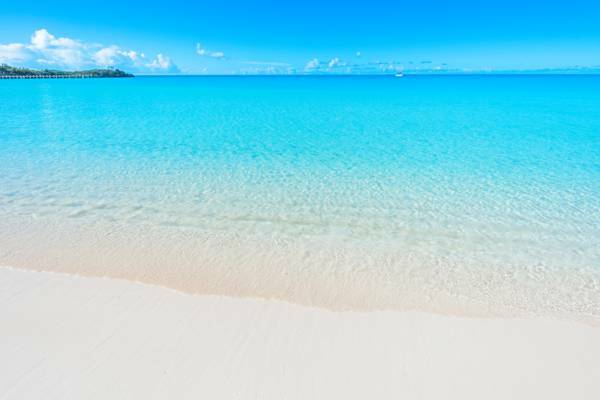 Nearly all of the beach sand in the Turks and Caicos is of coral and shell origin, much of which is produced near the barrier reefs. The Caicos Banks is an extensive and shallow sandy marine plateau that extends to the south of the Caicos Islands. Sapodilla Bay is located on the far downwind side of these banks, and the sand that is accreted at the bay has travelled a great distance, and thus has been worn and becomes very fine grained. In contrast, Malcolm’s Road Beach on the remote west coast is quite close to an extensive reef system, and consequently the sand is irregular, coarse (which actually means it’s very soft to step on), and peach hued. When visiting Sapodilla Bay, there are a few other sights and coast that you’ll likely want to see, especially if you’ve made the drive across the island from Grace Bay, Leeward, or Long Bay. Chalk Sound National Park is the foremost attraction in the area, and a globally-unique landscape. This vibrant turquoise lagoon features hundreds of tiny limestone islands. Adjacent to Sapodilla Bay is a site of historical interest: the Sapodilla Bay Hill Rock Carvings. This 50 foot (15m) hill features fascinating panoramic views over Chalk Sound, the beaches, the villas, and the country’s primary freight port of South Dock. A nearby beach that’s similar in atmosphere to Sapodilla Bay is Taylor Bay. This coast is a little larger, yet is more difficult to find and get to. The closest restaurant to Sapodilla Bay is the excellent Las Brisas Restaurant. This establishment also rents kayaks in Chalk Sound, and offers a sightseeing boat cruise in the lagoon as well. It’s straightforward and simple to find Sapodilla Bay. Two access and parking areas are found here: one at each end of the beach. Sapodilla Bay Beach from the water. On the southern side, this beach shares an access with the Sapodilla Bay Hill Rock Inscriptions trail. There’s ample parking, and a short path between two villas to the beach. The road for this access is found close after the start of Chalk Sound Drive, the main road in the Chalk Sound peninsula. Shortly after making the turn from South Dock Road onto Chalk Sound Drive (330 feet or 100m), an unpaved road is located on your left. You’ll know you’re in the right area if you see the small police station. The unpaved road terminates after a short distance at the parking area for the beach and hill path for the rock carvings. Yachts moored off Sapodilla Bay. Another great access is located at the northern end of the beach. After entering Chalk Sound Drive at the police station, simply continue .3 miles (.5km) (you’ll pass the unpaved road on the left for the Sapodilla Hill access, and the entrance for Las Brisas), and you’ll arrival at an open unpaved parking area on your right. To get to the beach, you’ll have to walk across the road and down a short sandy path. Sapodilla Bay Beach is one of the safest beaches on Providenciales. The water is shallow and calm, currents and waves are very unusual (typically only experienced during passing tropical cyclones and hurricanes), and there are no hidden dangers or underwater hazards near the beach. The main access for Sapodilla Bay Beach. Take the first left after turning on to Chalk Sound Drive from South Dock Road. This road is unpaved and will be found about 100 feet (30 meters) down Chalk Sound Drive. This is also the access for the Sapodilla Hill rock inscriptions. This access offers a small open space for parking and a short walking path to the beach. It’s found 500 feet (160m) past the entrance to Las Brisas Restaurant. The parking area is on the opposite side of the road, so you’ll have to cross the road to get to the beach. Last reviewed by an editor on 30 December 2018.